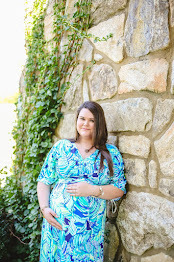 Some of the links below are affiliate links-thank you for clicking and purchasing in support of Southern & Style! October is a month that's one of my favorites for many reasons; the weather, the festivities, the food and more, but it's a special month to me for one reason in particular-it's Breast Cancer Awareness Month. If you've been reading my blog long, you'll know that my sweet Mother-in-Law fought breast cancer and won, she is a survivor of this terrible disease, so I love being able to take to this platform of mine and share products at the beginning of the month that will donate to Breast Cancer Awareness causes and research. Below I've added details about how much of your purchase price goes back to BCA and which causes it goes to, if I can find it. Also, since so many of these products donate to the Breast Cancer Research Foundation, I wanted to let you know what their mission is. The mission of BCRF is to prevent and cure breast cancer by advancing the world's most promising research. 91 cents of every donated dollar goes directly to this cause and BCRD is rated as one of the nation's most fiscally responsible charities. Just wanted to let y'all know because I know donating is so important-but it's also important to know where your money is going! These beautiful sandals are in such a trendy style and color just for breast cancer awareness! Buy now & wear if you're still in a warm climate or save for Spring. For every Lauren sandal purchased in the month of October, Jack Rogers will donate 10% of sales to the Breast Cancer Research Foundation. These bottles are perfect for keeping liquid cool or hot all day long, I can also imagine a pretty cute monogram decal being the perfect addition to it. During the month of October, 20% of the purchase price for this color S'Well bottle will go to the Breast Cancer Research Foundation. Bobbi Brown is a stellar makeup company for more than just their great products, they also habitually create products to donate to awesome causes like BCA. For every purchase of this product, Bobbie Brown will donate $11 to the Breast Cancer Research Foundation. This shopper tote is totally beautiful and perfect for carrying around for errands or even being a beach bag once beach season rolls back around. 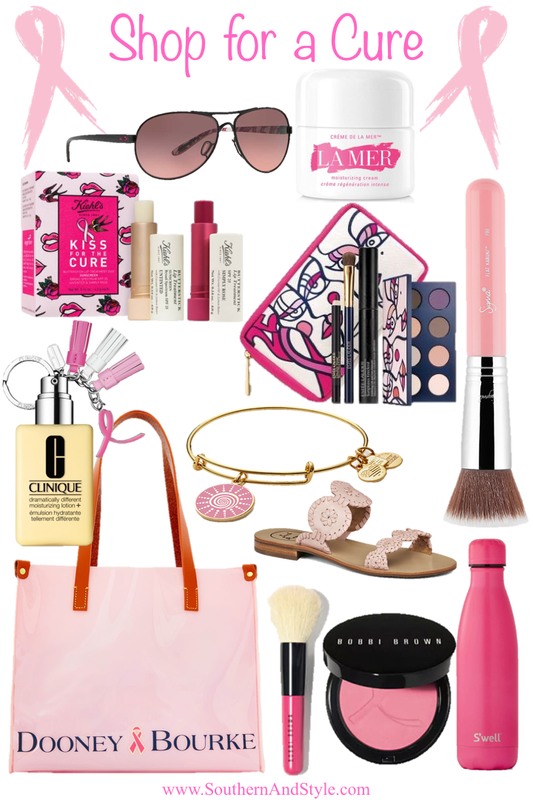 For each tote bag sold, D&B will donate 20% of the price to the Breast Cancer Research Foundation. I'm a huge fan of Alex & Ani bracelets because they are great for stacking. This beautiful charm is a spiral sun which reminds us to go with the flow and accept where life takes us and to feel the sun's warmth, nourishing as it shines upon us, and receive its vital force. Alex & Ani will donate 20% of the purchase price from each of these Spiral Sun bracelets sold with a minimum donation of $25,000 between January 2017 and December 2017 to the Breast Cancer Research Foundation. Sigma makes great quality brushes and this special limited-edition pink kabuki brush is that same amazing quality, just in a fun pink shade. Sigma will donate 20% of proceeds from each brush sold to Bright Pink, a non-profit organization empowering women to live proactively from a young age, saving lives from breast and ovarian cancer. Estee Lauder is another brand that consistently supports Breast Cancer Awareness and Research. This set contains an eyeshadow palette with 8 shades (all perfectly Fall appropriate), an eye pencil, mascara, an eyeshadow brush, and a cosmetics bag. Estee Lauder will donate 100% of the suggested retail price (not just the profits) of the palette to the Breast Cancer Research Foundation from September 2017 through June 2018. $10 from each purchase is donated to the Breast Cancer Research Foundation (Bonus, it's great for combination & dry skin, highly recommend!) It also comes with a Breast Cancer Awareness key chain! If you're looking for glasses with a cool style, but also give back-these Oakley's are for you! If you can't tell from the picture, the gradient in the lens is actually pink. Oakley will contribute $20 to Young Survival Coalition, which is a non-profit dedicated to the critical issues unique to young women who are diagnosed with breast cancer. Treat yourself (or a friend, once again Christmas present alert!) to smooth lips with this Kiehl's treatment, currently on sale at Nordstrom. Kiehl's will deliver a "kiss for the cure" with 100% of net profits up to $25,000 benefitting Breast Cancer Research. This product is perfect for the upcoming winter season, as it's great for moisturizing very dry skin. La Mer will donate $10 of the purchase price of this limited edition Creme de la Mer Moisuriting cream with a maximum donation of $52,680. GAP will donate 15% of the purchase price of this darling sleep set to the Breast Cancer Research Foundation when purchased between September 25-October 31, 2017. The perfect way for the guy in your life to support Breast Cancer Research, GAP will donate 15% of the purchase price to the Breast Cancer Research Foundation when purchased between September 25-October 31, 2017. Elemis is proud to partner with Breast Cancer Care for the 25th anniversary of the pink ribbon. To celebrate, Elemis is donating $30,000 to help Breast Cancer Care continue it's excellent work supporting women living with and beyond breast cancer. Purchase these beautiful ombre pink leggings for a great cause! One dollar from the purchase of every item sold in the collection between September 21-October 31, 2017 will be donated to The Keep a Breast Foundation. These adorable beaded bracelets in shades of pink with attached tassels give back for good, proceeds from your purchase will be donated to The Keep a Breast Foundation, whose mission is to empower young women around the world with breast health education and support. Thank you so, so much for checking out this post and the products within it, it truly is a cause near and dear to my heart and I appreciate everyone's support! Love a post with a cause behind it. Thanks for sharing! I love when companies give to research funds! Thanks for putting this together :) And your mother-in-law is a badass! So glad your mother-in-law won her battle. <3 Cancer runs in my family and sadly, I lost my aunt to breast cancer. I'm really passionate about helping the cause though, so I'll definitely have to buy some of this stuff. :) Thank you for sharing! Love shopping for a cure! I regularly shop with Amazon Smile. These products would make fabulous gifts for the upcoming holidays- so inspiring! Love shopping for the cause! The Alex & Ani bracelet would be a great gift! Awesome roundup!! I love how these give back! I'm eyeing those blush sandals! Another reason I love this month: so much pink! This is such a brilliant idea! I totally love this for a cause. Love that all these products support such a worthy cause! Love this post! So many great products for such an amazing cause!